This stall is always a really popular attraction at a village fete or summer fair. It's also dead easy to set up and run. 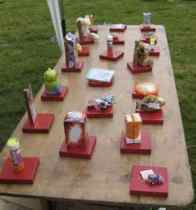 A number of prizes are positioned on individual wooden blocks. This can be on the ground or on a table. People then throw small wooden hoops trying to get their ring to fall right over a prize to win it. The hoops are generally about 20cms in diameter. Suitable hoops can usually be purchased from craft shops. It is however easy to make your own by cutting them out of a sheet of plywood. Painting the hoops and blocks gay colours adds to the look of your stall. If space allows small flower pots turned upside down and painted can also make great stands for the prizes. Good prizes are bottles of drink, perfume, bubble bath etc. Chocolate bars attached to wooden blocks so they stand upright are popular with children. An old fairground trick is to attach banknotes with rubber bands to certain prizes. Do the maths however and have a good practice to make sure that you don't make things too easy. 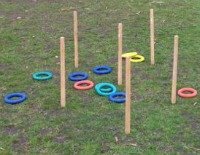 Here is a simple variation, perfect for a school fete or summer fair.Hoop a stick to win a small prize. This is a great variation on the normal fundraiser if you have the space. Sink 30 empty wine bottles about six inches into the ground. You can use a garden bulb planter to pull a plug of soil out). Space them about 30cms apart. Anyone who lands a hoop over a bottle then wins a prize. You could also colour code the bottles and make some harder to "hoop" than others to win specific prizes. If you have space outdoors this is a novel fundraising idea. Get people to throw kid's Hula Hoops over a chair, stool or weighted traffic cone to win a prize. You need to position the target at an appropriate distance to set a realistic challenge. Kid's versions alongside adult is often a good idea. Here is an interesting variation on the theme. Wooden cactus provide a perfect opportunity for showing your prowess. 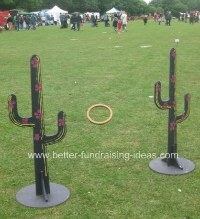 Perfect for any fete but particularly good for fundraising barn dances, barbecues or Wild West fundraisers. A hoopla stall at your fete is always going to be really popular. Give it a go. Keep it fun and watch the cash come your way.